Albogachiev A.Y., Jashkov V.A., Silin L.V. Abrasive processing is one of the most widespread modes of machining of constructional materials. The wide circulation of grind is promoted by development of new high-efficiency methods of processing (power, deep, high-speed etc.). Need of improvement available and creation of new technologies is caused by complexity of implementation of the process of grind in connection with non-stationary conditions of cutting. Now for the solution of problems of optimization of processes of grind, due to the lack scientifically reasonable data on communication of technological conditions with results of processing, the exclusively experimentally received sedate dependences of target parameters on grind modes are used. Thus, any solution of a problem of optimization is fair only for these experimental conditions and can’t be transferred on other conditions. In the real work questions of ensuring quality of a surface after grind by a modular abrasive circle are considered. Quality was estimated by means of curve Abbota. Keywords: grinding, mathematical modeling, the temperature. Gusev V.G., Blurcjan D.R., Trifonova Y.V. Advantages and features of the progressive process of grinding wheels with holes radially movable segments // Proceedings of the Actual problems of mechanical engineering. – Vladimir: Vladimir State University, 2002. – P. 67-70. Silin L.V., Jashkov V.A. Technological approach to reduce the duration of the running // Fundamental and applied problems of Engineering and Technology, 2011, № 4. – P. 100-103. Silin L.V., Jashkov V.A. Internal grinding technology without thermal effects // STIN, 2012, № 3. – P. 22-25. Silin L.V., Jashkov V.A., Albagachiev A.Y. Development of a mathematical model of the process of heat transfer at internal grinding prefabricated abrasive wheel // Engineering industry and life safety, 2009, № 6. – P. 182-184. 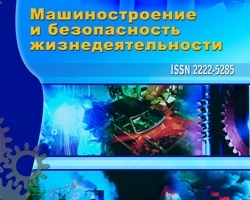 Albogachiev A.Y., Jashkov V.A., №4 (14) 2012, Quality assessment of the supporting surfaces in grinding prefabricated abrasive wheels, Silin L.V.